Our chandelier lighting is designed to be easy to fit in to any DIY Marquee, everything you need is included in the package to give a professional and flexible lighting system for your marquee. Our Retro festoon lighting is designed to be easy to fit in to any DIY Marquee. This string of Retro marquee festoon lights comes with 10 x 40W screw cap bulbs. Each hanging bulb has a 15cm drop which can be extended by 40cm for up to 4 of the bulb holders. 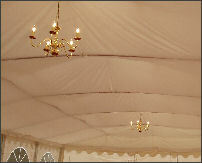 Retro marquee festoons are not suitable for use in the roof framework for marquees with linings.